Robert Hunter was born in June 1888 at Georgia. He was the son of Dock Hunter and Levia Bell. [S245] U.S. Federal Census 1900 U.S. Federal Census, by Ancestry.com, Year: 1900; Census Place: Bairdstown, Oglethorpe, Georgia; Roll: 215; Page: 3A; Enumeration District: 0091; FHL microfilm: 1240215. [S244] U.S. Federal Census 1910 U.S. Federal Census, by Ancestry.com, Year: 1910; Census Place: Bowling Green, Oglethorpe, Georgia; Roll: T624_206; Page: 4B; Enumeration District: 0125; FHL microfilm: 1374219. Mamie Hunter was born in March 1890 at Georgia. She was the daughter of Dock Hunter and Levia Bell. Name Variation Oline Hunter was also known as Aileen. Oline Hunter was born in September 1892 at Georgia. Maconeal Hunter was born in August 1893 at Georgia. 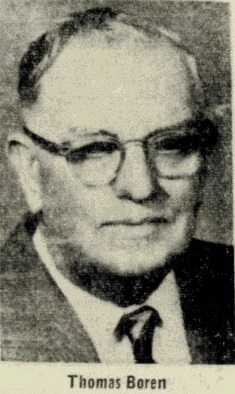 Maconeal Hunter died in 1977. [S243] U.S. Federal Census 1920 U.S. Federal Census, by Ancestry.com, Year: 1920; Census Place: Bowling Green, Oglethorpe, Georgia; Roll: T625_273; Page: 12B; Enumeration District: 134. John C. Hunter was born in October 1894 at Georgia. Mary S. Hunter was born in January 1898 at Georgia. Howard Hunter was born on 2 July 1902 at Georgia. Howard Hunter died on 29 August 1925 at Warwick, Chester, Pennsylvania, at age 23. 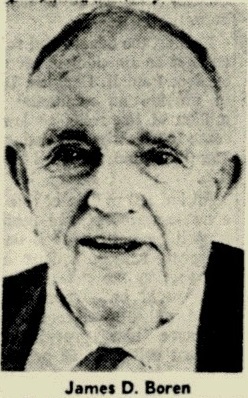 Sanders Hunter was born circa 1904 at Georgia. Thomas Hunter was born circa 1906 at Georgia. Nat Hunter was born circa 1908 at Georgia. Oscar Hunter was born circa 1912 at Georgia. [S250] U.S. Federal Census 1930 U.S. Federal Census, by Ancestry.com, Year: 1930; Census Place: Atlanta, Fulton, Georgia; Roll: 361; Page: 17B; Enumeration District: 0069; FHL microfilm: 2340096. Nathaniel Hunter was born circa 1913 at Georgia. Howard Hunter was born in September 1899 at Georgia. Thomas Boren was born on 25 January 1882 at Williamson, Illinois. He was the son of Ephraim Boren and Amanda Stumm. Thomas Boren married Lillian Emma Everly, daughter of Usual M. Everly and Edith Valeria Barns, on 27 November 1907 at Jonesboro, Illinois. Thomas Boren died on 25 November 1958 at St Louis, Missouri, at age 76 Thomas Boren obituary. 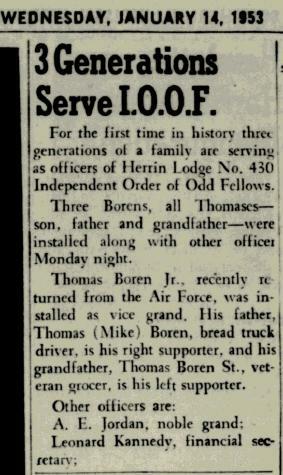 In January 1953 at Illinois Three Boren generations serve IOOF. [S245] U.S. Federal Census 1900 U.S. Federal Census, by Ancestry.com, Year: 1900; Census Place: Carterville, Williamson, Illinois; Roll: 354; Page: 6B; Enumeration District: 0108; FHL microfilm: 1240354. [S244] U.S. Federal Census 1910 U.S. Federal Census, by Ancestry.com, Year: 1910; Census Place: Herrin Ward 4, Williamson, Illinois; Roll: T624_335; Page: 2B; Enumeration District: 0162; FHL microfilm: 1374348. [S243] U.S. Federal Census 1920 U.S. Federal Census, by Ancestry.com, Year: 1920; Census Place: Blairsville, Williamson, Illinois; Roll: T625_418; Page: 7B; Enumeration District: 153. [S250] U.S. Federal Census 1930 U.S. Federal Census, by Ancestry.com, Year: 1930; Census Place: Herrin, Williamson, Illinois; Roll: 570; Page: 11B; Enumeration District: 0006; FHL microfilm: 2340305. Name Variation Lillian Emma Everly was also known as Lilian. Name Variation Lillian Emma Everly was also known as Emma L.
Name Variation Lillian Emma Everly was also known as Lylian Emma. Married Name 27 November 1907 As of 27 November 1907,her married name was Boren. Lillian Emma Everly was born on 23 August 1881 at Beaver Dam, Ohio, Kentucky. She was the daughter of Usual M. Everly and Edith Valeria Barns. Lillian Emma Everly married Thomas Boren, son of Ephraim Boren and Amanda Stumm, on 27 November 1907 at Jonesboro, Illinois. Lillian Emma Everly died on 5 June 1965 at Herrin, Williamson, Illinois, at age 83 Lillian (Everly) Boren obituary. In June 1949 at Illinois attended Lemons Boren family reunion. Ray E. Boren was born on 17 May 1919 at twin with Faye, Herrin, Williamson, Illinois. He was the son of Thomas Boren and Lillian Emma Everly. Ray E. Boren married Mary Belle Francis on 9 July 1938. Ray E. Boren died on 9 March 2012 at Herrin, Williamson, Illinois, at age 92 Ray E. Boren, 92, passed away 5 p.m. Friday, March 9, 2012, at his residence. Ray formerly co-owned and operated with his wife, Mary Belle, the Boren's IGA grocery stores in Herrin, Harrisburg and Carbondale. What started as a small store with his father, Tom, and brother, Woodrow, in 1903, served the community of Herrin for more than 80 years. He was a longtime director of the Herrin Security Bank Board and retired as director emeritus for the Herrin Security Bank in Herrin. Ray was a deacon and taught Boy's Sunday school class at First Baptist Church in Herrin. He was a veteran of the U. S. Navy during World War II, serving with the Seabee's in Guam and Okinawa. Ray and his wife, Mary Belle, loved to travel throughout the world with their family and close friends, Bob and Dorothy Mercer, Ruth Wilma and Tommy Colombo. His many contributions to the City and Community were not for personal recognition, but for the pleasure of bettering his community and the world around him. He helped many a child to achieve their academic educations by offering employment to them. His memberships included but were not limited to, lifetime membership in the Herrin Elks, Baker-Ladd VFW Posts 1567, Herrin American Legion Post 645, Herrin Chamber of Commerce, Herrin Better Business Assn., to which he was their biggest promoter and supporter, Herrin United Way, volunteer at the Herrin Hospital for 15 years, former member of the Herrin Kiwanis's Club, Oddfellows Club, Executive Committee Director of the Illinois Food Retailer's Association. He was one of the founding organizers of HerrinFesta Italiana and was honored as a Special Guest in 2011, awarded the Distinguished Service Award from the Herrin Chamber of Commerce in 2006 and assisted with coordinating the Mayor Quaglia's Thanksgiving Dinner for the citizens of Herrin. Ray was born May 17, 1919, in Herrin, to Thomas and Lylian (Everly) Boren. Ray was united in marriage with Mary Belle Francis on July 9, 1938, in Jackson, Mo. She preceded him in death May 11, 2009. Surviving are daughter, Brenda Preston and Ed Schullian of Herrin; two sons and a daughter-in-law, Jerry Boren of Carbondale, and David and Amy Boren of Herrin; five grandchildren, Amy Suchadoll and her husband, Jeff, of Houston, Texas, James Neal Preston and fiancée, Sarah Varoujean of Portland, Ore., Brian Preston and fiancée, Beth Foster of Herrin, Joshua Boren of Herrin and Danielle Boren of Herrin; four great-grandchildren, Jordan Preston, Brandon Suchadoll, Jake Suchadoll and Jenna Suchadoll. Also surviving are sister-in-law, Barbara Francis of Herrin; nephews and nieces, Tom Boren and his wife, Ibby Jean, of Maumelle, Ark., Morris "Chick" Boren and his wife, Carlen, of Cordova, Tenn., Terry Boren and his wife, Maria, of Barnes, Wis., Mike Musgrave and his wife, Pam, of Walnut Creek, Calif., Jim Francis and his wife, Wendy, of Rochester, Minn., Paul E. Francis of Herrin and Sallie Ann and Brian Suprenant of Herrin; several great-nieces and nephews; and close friends, Dorothy Mercer and Melba Thurman, both of Herrin. He was preceded in death by his wife; parents; siblings, Helen Long, Mike Boren, Woodrow Boren and twin sister, Faye Musgrave; niece, Lynne Rae Hindman; nephew, Ronnie Musgrave; brother-in-law, Paul Francis; and his close friends, Bob Mercer, Ruth Wilma and Tommy Colombo. Services will be 11 a.m. Wednesday, March 14, in First Baptist Church in Herrin, with the Revs. Don Grammer and Mark Hutson officiating. Interment with military graveside rites conducted by the Herrin American Legion, Baker-Ladd VFW Posts and Illinois Army National Guard Honor Detail will be in Herrin City Cemetery. Visitation will be from 5 to 8 p.m. Tuesday, March 13, in Meredith-Waddell Funeral Home in Herrin. Memorial donations may be made to TIP Hospice or First Baptist Church, 1500 South 13th St., Herrin, IL 62948; envelopes will be available at the funeral home. Published in The Southern Illinoisan from March 10 to March 11, 2012. 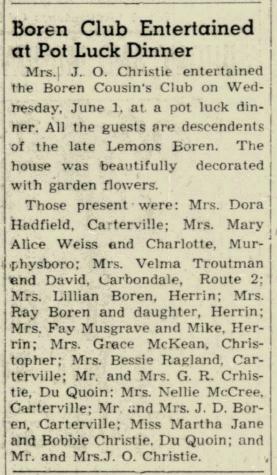 In June 1949 at Illinois attended Lemons Boren family reunion. In May 1966 at Illinois Borens IGA article including brothers Woodrow and Ray Boren. Name Variation Mary Belle Francis was also known as Mary Bell. Married Name 9 July 1938 As of 9 July 1938,her married name was Boren. Mary Belle Francis was born on 18 July 1919 at Herrin, Williamson, Illinois. She married Ray E. Boren, son of Thomas Boren and Lillian Emma Everly, on 9 July 1938. Mary Belle Francis died on 11 May 2009 at Herrin, Williamson, Illinois, at age 89 Mary Belle Boren, 89, of Herrin, passed away 9:30 a.m. Monday, May 11, 2009 at her residence surrounded by her loving husband and family. Services will be 11:00 a.m. Friday, May 15, 2009 at Meredith-Waddell Funeral Home in Herrin. Rev. Donald Grammer will officiate. Interment will be in Herrin City Cemetery at Herrin. Visitation will be from 5:00 p.m. until 8:00 p.m. Thursday, May 14, 2009 at Meredith-Waddell Funeral Home in Herrin. Memorial donations are the preferred form of remembrance and may be made to TIP Hospice or to the First Baptist Church of Herrin, envelopes will be available at the funeral home. Mrs. Boren was primarily a homemaker during her lifetime, and was best known for her meals on Sunday for her family and taking care of her five grandkids. Mary Belle and her husband, Ray, formerly owned and operated the Boren IGA Stores in Herrin, Harrisburg and Carbondale and during World War II, she also worked for an ordinance plant and a Lemon Packing Plant in San Diego, CA. She was a member of the First Baptist Church in Herrin, Beta Sigma Phi Sorority and the Herrin Women's Club. She was born July 18, 1919 in Herrin, IL to Ray and Hazel (Ladd) Francis. Mary Belle was united in marriage with Ray E. Boren on July 9, 1938 in Jackson, MO. Surviving are her husband of 70 years, Ray E. Boren of Herrin; three children, Brenda Preston of Herrin, Jerry Boren of Carbondale, David and Amy Boren of Herrin; five grandchildren, Amy (Jeff) Suchadoll of Houston, TX, James Neal Preston of Portland, OR, Brian Preston (Mrs. Boren's care-giver) of Herrin, Joshua Boren and Danielle Boren of Herrin; four great grandchildren, Jordan Preston, Brandon Suchadoll, Jake Suchadoll and Jenna Suchadoll; brother and sister-in-law, Paul and Barbara Francis of Herrin; nieces and nephews, Thomas (Ib) Boren of San Diego, CA, Chick (Karleen) Boren of Covington, TN, Terry and Maria Boren of Barnes, WI, Michael and Pam Musgrave of San Francisco, CA, Paulie Francis of Herrin, Sally (Brian) Suprenant of Herrin and Jim and Wendy Francis of Rochester, MN and special friend, Dorothy Mercer of Herrin. She was preceded in death by her parents and an infant sister. Meredith-Waddell Funeral Home, Herrin, IL. Name Variation Rebajean Mae Talley was also known as Reba. Married Name circa 1935 As of circa 1935,her married name was Boren. Rebajean Mae Talley was born on 24 May 1919 at Marion, Williamson, Illinois. She was the daughter of Samuel A. Talley and Ruby Fern McWilliams. Rebajean Mae Talley married Woodrow Wilson Boren, son of Thomas Boren and Lillian Emma Everly, circa 1935. Rebajean Mae Talley died on 30 April 2002 at age 82. Married Name Her married name was Hindman. Lynn Rae Boren married Bill L. Hindman. Lynn Rae Boren was born on 17 August 1936 at Herrin, Williamson, Illinois. She was the daughter of Woodrow Wilson Boren and Rebajean Mae Talley. Lynn Rae Boren died on 26 February 2003 at age 66 Lynn Rae (Boren) Hindman, 66, died Wednesday, Feb. 26, 2003, at her home. There will be no visitation. The body will be cremated. The family of Mrs. Hindman requests that friends spend time with the one who gives eternal life. Mrs. Hindman was born August 17, 1936, in Herrin to Woodrow Boren and Reba Jean (Talley) Boren. She graduated from Herrin High School in 1954 and attended Southern Illinois University and graduated from the Barnes Hospital School of Nursing in 1959. She is survived by her son, Jay Boren and wife Dee of Orangeville, Calif; daughters, Kelley and husband Mike Meyer of Newport, Wash. and Tracy Mumey of Herrin; sister, Iva Nell and husband Gene Stiman of Salem; brother, Terry and wife Maria Boren of Rogers, Minn; grandchildren, Joshua and Jacob Hindman of Orangeville, Calif, Michael, Mason and Megan Meyer of Newport, Va. and Eden and Nicole Mumey of Energy; beloved aunt and uncle Mary Belle and Ray Boren of Herrin and several nieces and nephews. She was preceded in death by her parents; her huband, Bill L. Hindman and her grandparents, Tom and Lillian Boren and Sam and Rudy Talley. Bill L. Hindman married Lynn Rae Boren, daughter of Woodrow Wilson Boren and Rebajean Mae Talley. Married Name Her married name was Schullian. Married Name Her married name was Preston. Brenda Carol Boren was born on 20 May 1947 at Herrin, Williamson, Illinois. She was the daughter of Ray E. Boren and Mary Belle Francis. Brenda Carol Boren died on 1 December 2014 at Herrin, Williamson, Illinois, at age 67. Married Name Her married name was Long. Helen M. Boren married (?) Long. Helen M. Boren was born circa 1909 at Illinois. She was the daughter of Thomas Boren and Lillian Emma Everly. Helen M. Boren died after 1958. Helen M. Boren lived in 1958 at Brooklyn, New York. (?) Long married Helen M. Boren, daughter of Thomas Boren and Lillian Emma Everly. Married Name Her married name was Musgrave. Faye Boren married Mike Musgrave. Faye Boren was born on 17 May 1919 at twin with Ray, Herrin, Williamson, Illinois. Faye Boren died on 5 February 2002 at age 82. Mike Musgrave married Faye Boren, daughter of Thomas Boren and Lillian Emma Everly. Name Variation Thomas Mike Boren was also known as Mike. Name Variation Thomas Mike Boren was also known as Maurice. Thomas Mike Boren was born on 16 October 1910 at Illinois. Thomas Mike Boren married Ollie N. Stover circa 1930. Thomas Mike Boren died on 29 July 1985 at Herrin, Williamson, Illinois, at age 74. Ephraim Boren was born on 23 July 1858 at Jackson, Illinois, also reported as Jun 1858. He was the son of Lemons Boren and Melissa A. Crain. Ephraim Boren married Amanda Stumm, daughter of Thomas Stumm and Mary A. (? ), circa 1877. Ephraim Boren died on 20 August 1929 at Carterville, Williamson, Illinois, at age 71. Married Name circa 1877 As of circa 1877,her married name was Boren. Amanda Stumm was born on 29 November 1859 at Massac, Illinois, also reported as Jackson county, IL. She was the daughter of Thomas Stumm and Mary A. (?). Amanda Stumm married Ephraim Boren, son of Lemons Boren and Melissa A. Crain, circa 1877. Amanda Stumm died on 2 July 1935 at Herrin, Williamson, Illinois, at age 75. James Dallas Boren married Lulu Mae (?). James Dallas Boren was born on 24 January 1880 at Williamson, Illinois. 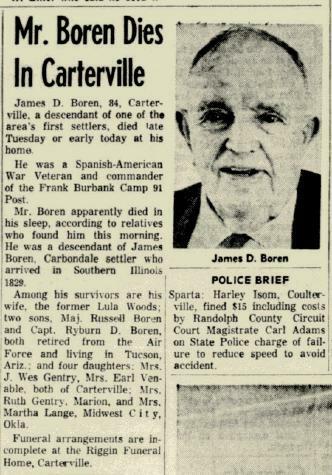 James Dallas Boren died on 5 February 1964 at Carterville, Williamson, Illinois, at age 84 James D Boren obituary. Grace Boren was born in December 1883 at Illinois. She was the daughter of Ephraim Boren and Amanda Stumm. Grace Boren died before 1958.